Ahhh yeah! This thing is as All-American as county fairs. If you are a rider who wants a helmet that showcases speed, style, and your patriotic spirit… keep reading. 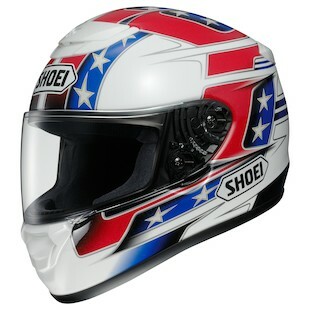 The new Shoei Qwest Banner Helmet is what Evel Knievel might have worn had the darn thing existed back then. The American flag themed graphic would have fit in wonderfully with the rest of his outfit. With bars of Red, and Blue set against the White helmet and lined with stars, there is absolutely no mistaking the allegiances of the rider wearing this. In fact, it is said that George Washington wore it atop his head at Valley Forge (that is not even remotely true), and legend has it that Thomas Edison wore it as his “thinking cap” right before he invented the correct iteration of the light bulb (again, that is not at all how history actually happened). 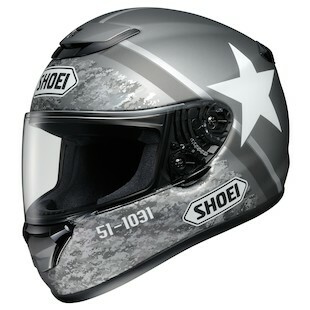 Another new graphic that has been addd to the Shoei Qwest lineup is the Shoei Qwest Resolute Helmet. With a mix of digital urban camo and fighter jet insignia, it is a mean looking lid that screams for afterburners. It has been told that it is the actual helmet Will Smith wanted to wear in Independence Day because he told the director “only someone wearing this could save the world from an alien takeover.” (ugh… okay, that is not true either… but it should be!). Even if Paul Bunyan didn’t throw on either of these helmets before chopping down trees and riding his blue ox around the great outdoors, each of these lids still rock. If you are interested in quality, design, and style, you should check them out.